You must have noticed that the art world has gone mad. Prices have reached the point on the dial that should read “Totally obscene”. The rich are sitting in their offshore nests with their beaks open, clamouring for more. The market is feeding them crazily on whatever stretches of underexploited art territory it can locate and pillage. And those art-world cuckoos, the curators, are frantically enlarging the “canon” to include all the reputation-making flavours they can cram into the pot. So it’s the Wild West out there. But there is a plus side to this lunacy. The trampling down of pre-existing boundaries by a demented art market, and its sidekicks, the curators, has led to the re-evaluation of big stretches of undervalued aesthetics. Chief among these reminings are all the artists elbowed out of the limelight by the supernova of modernism — the forgotten painters of the 1920s and 1930s. It was Alfred H Barr, the first director of the Museum of Modern Art in New York, the power broker at MoMA from 1929 to 1968, who constructed the fantasy timeline for modernism that is currently being challenged on so many fronts. The Barr timeline — cubism, constructivism, surrealism, abstract expressionism and so on — was a rigid track, lacking any semblance of aesthetic generosity. Which is why so many of the painters included in America’s Cool Modernism, at the Ashmolean in Oxford, are so new to me. John Covert, George Ault, Morton Livingston Schamberg, George Josimovich — where have you been hiding? The show looks back at a generation of American painters and photographers, active from about 1915 to 1940, who were aware of the Barr timeline, but who didn’t buy fully into its rules. No one here is fully a cubist or fully a futurist. Everyone here has some of those tendencies. Up to speed with progressive events in Europe, this is a generation of soft-centre refuseniks keen to add an American flavour to the moment. And it is this lack of purity, this American interstitiality, that finally unites them. Had it been up to me, I would have called the show America’s Mongrel Modernists. But it isn’t up to me. We start with a room that seeks to set the agenda, but that manages also to outline the problem. Modernity, as an American quality, is represented spectacularly well by the architecture of New York and Chicago. The glass towers, the thrilling skylines, the upward thrusting of the city, are unimpeachably progressive sights, and the photographs of Alfred Stieglitz and Paul Strand, with their inherent sense of black-and-white clarity, are a perfect vehicle for conveying the futuristic excitement of the American metropolis. Later in the journey, Berenice Abbott and Margaret Bourke-White supply even clearer proof that modernity and photography went together like love and marriage. But while Abbott, Bourke-White, Strand and Stieglitz, with their taste for right angles and straight lines, for abstract forms and radical clarity, provide firm photographic evidence for a modernity that appears effortless and right, the painters who pop up in the show’s opening stretches seem, from the off, to be struggling with something more complex: something deeper, more inherent, more American, and — apologies, Ashmolean — less cool. The first picture we see, Marsden Hartley’s Painting No 50 (1914-15), looks initially like a bold pattern of abstract colours: triangles, dots and semicircles. But the caption warns us that Hartley took his inspiration from Native American art, and that what he was actually attempting here was a critique of modern mechanised society. The bright abstract shapes form a winged tepee, and their covert ambition is to promote a return to the spiritual values of the past. This endemic American hunger for deeper meanings never disappears fully from the show ahead. It’s what makes the exhibition simultaneously chaotic and fascinating. The photographers seem eagerly to swallow the myth of progress, but the painters never do. Thus the aptly named John Covert gives us a jigsaw puzzle of rectangles and roundels, with a big thrusting pyramid in the middle, that turns out to be entitled Resurrection. In the next alcove, Arthur Dove shows the American landscape throbbing and glowing with enough mystical auras to fill 100 seances. While Georgia O’Keeffe, in a strange picture called Black Abstraction, from 1927, in which overlapping blacks overwhelm a tiny dot of white, is actually painting the blackout she experienced when she went to hospital to be operated on for a lump on her breast and was knocked out by the anaesthetic. Thus the modernity here feels insistently hesitant or reluctant. (Perhaps that’s what the organisers actually mean by “cool”?) Recurrent searches are mounted for “spiritual” feelings that have been lost. There’s much touching for handholds in the past. 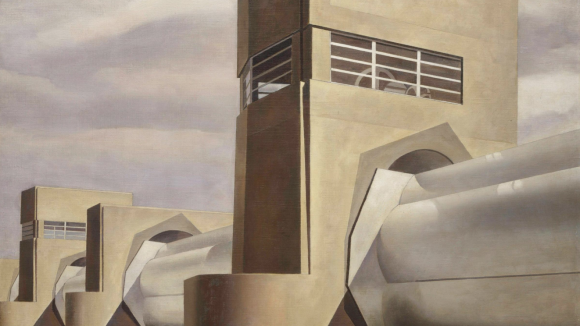 Charles Sheeler, one of the show’s most compelling strangers, paints factories and industrial interiors with moods so gentle, they belong in a chapel. His pared-down manner, with its fondness for angelic whites, turns machines and equipment into beautiful abstractions. Sheeler, it turns out, was a collector of Shaker furniture. And what he was principally after in his paintings was not an atmosphere of modernity, but simple and wholesome Shaker moods. With all these forces pulling hither and thither below its waterline, the show meanders entertainingly from stretch to stretch. Halfway along, in a section dominated by prints and photographs, we spend a decent amount of time looking up at New York’s skyscrapers, paying genuine homage to the progressive thrusts of the city. But as soon as we get down among the painters again, the feeling returns that we are not really here to celebrate modernity, but to question it. 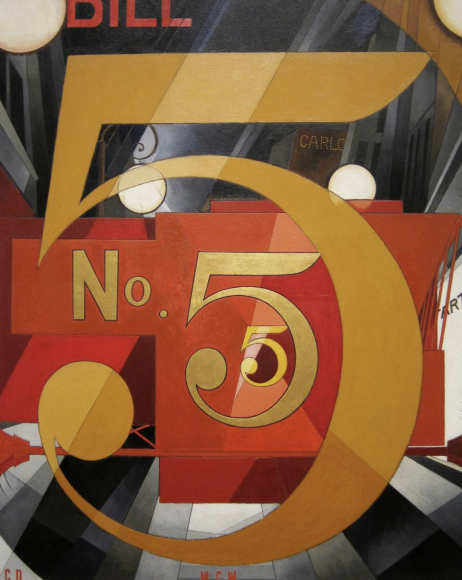 Charles Demuth’s famous I Saw the Figure 5 in Gold, from 1928, one of several impressive loans from the Metropolitan Museum of Art in New York, turns out to have been inspired by a poem by William Carlos Williams, describing a red fire engine with the number five emblazoned on its side, roaring through the streets. It’s a painting about a poem about a fire truck. And its atmosphere is more boy’s bedroom than futurist manifesto. Who should emerge in the final room but Grant Wood, the hokey creator of American Gothic, and a painter who had Alfred H Barr reaching for his garlic and his crucifix. 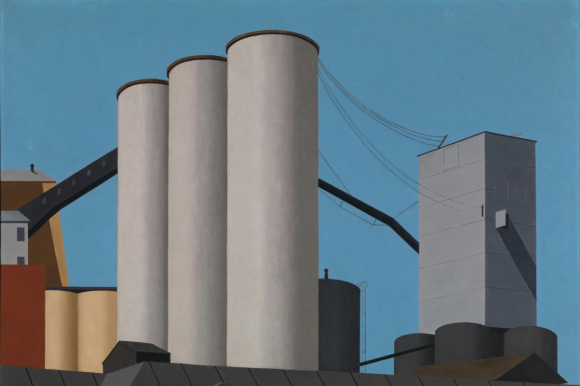 A series of beautifully precise Iowa landscapes sees Wood, like Sheeler, searching for a poetic American simplicity that shares some of its forms with modernism, but none of its spirit. The final artist here, Edward Hopper, doesn’t even do that. 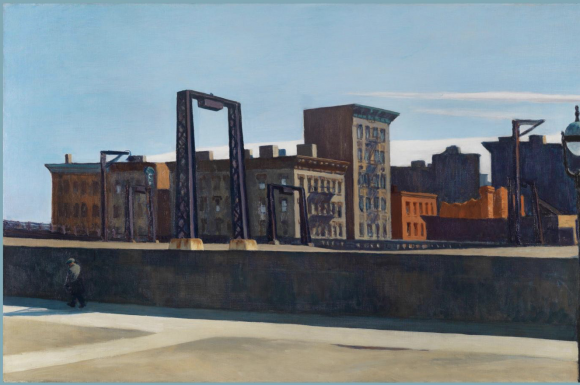 Hopper’s harsh, silent, lonely views of the city rip all the excitement out of modern living. His ugly Manhattan skylines, the nosy stares through other people’s windows, are dank with pessimism. Where others at this event search frantically for spiritual succour, Hopper notices its contemporary absence, and insists on pointing it out. I don’t think this show set out to give the MoMA story and the understandings of Alfred H Barr a kicking. But that is what happens.